The landing screen for the Qwiki iPhone app. 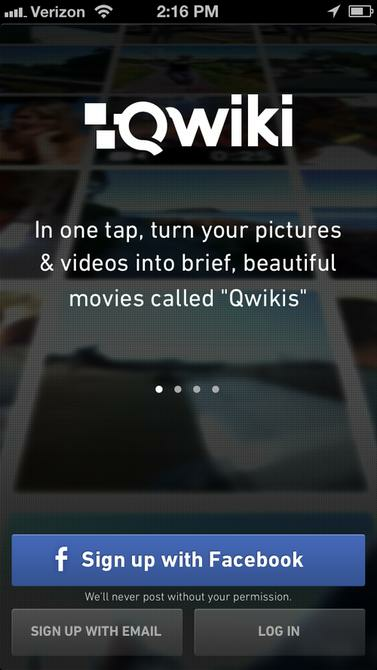 The Qwiki app takes pictures and videos that people already have on their iPhones and splices them together to create a short movie, complete with scene transitions and music. Terms of the deal, announced Tuesday, were not disclosed. Yahoo said it will continue to support the Qwiki app, and the Qwiki team will move into Yahoo's New York City office to "reimagine Yahoo's storytelling experience," Yahoo said. The Qwiki app will continue to exist as a standalone entity inside Yahoo, Qwiki's team wrote. The app can either be used in auto mode, where it creates the movie and gives users the option to apply edits afterwards, or movies can be created manually. In auto mode, the app scrapes the iPhone's camera roll, determines that certain photos or videos are related, and creates a slideshow-like montage of those images, incorporating music from the person's library. Certain elements, such as the song selection, filters or captions, can be changed afterwards. Individual pictures and video clips can also be rearranged, added or removed. Qwiki differs from mobile video apps like Twitter's Vine or Facebook's Instagram video because it uses content already on people's phones. Vine and Instagram are for recording and sharing new clips. Qwiki movies can be shared via Facebook, Twitter, email and SMS, or embedded in blogs and Web pages. The app is currently available only in Apple's App Store; there is no version for Android devices. Yahoo plans to integrate Qwiki's technology with other content services on its site, a spokeswoman said via email. Details are blurry, but Yahoo implied on Twitter that users may be able to use Qwiki with its Flickr photo sharing service, for instance. "Stay tuned ... there's much more to come," Yahoo said in its blog post. Yahoo is already trying to woo users through photography. In May it gave Flickr a huge makeover, emphasizing a more photo-rich interface and a terabyte of free storage. Acquisitions, particularly in mobile, have been a major theme at Yahoo over the past several months. Other recent purchases include Astrid, a to-do app; Summly, a news summarization service; GoPollGo, a social polling tool; and Jybe, a discovery and recommendation startup. Another major acquisition for Yahoo was Tumblr, announced in May as part of the company's larger efforts to reinvent itself and win back users.